Made with natural ingredients, Mighty Cheese Crunch satisfies your savory snack craving without the guilt. Naturally gluten-free and an excellent source of calcium, these versatile crisps are great on the go, paired with your favorite meal, or topping soups or salads for that extra tasty crunch. Featuring a winning combination of cheddar cheese and bacon, any way you crunch 'em, you're sure to love 'em. 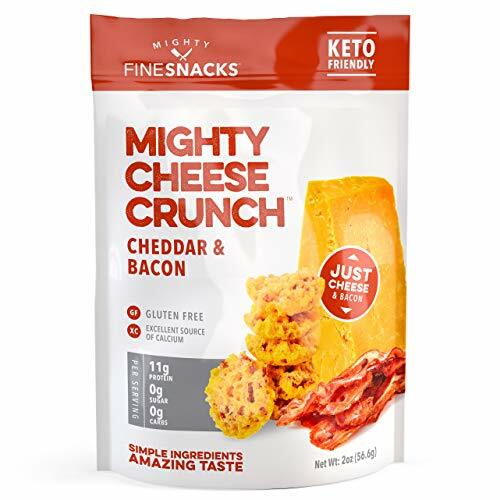 KETO & LOW CARB DIETERS: Mighty Fine Snacks Cheddar and Bacon Crunch are natural cheese and bacon snacks that are a great-tasting, diet-friendly crunchy snack. Low in carbs and high in protein, these crunches are made with is natural ingredients like cheddar, egg whites and bacon. GLUTEN AND GRAIN-FREE: No added preservatives, no gluten, and no fillers our product is a great substitution for carb loaded snacks like salty crackers or chips. Mighty Cheese Crunch uses gourmet cheese and egg white protein provide you with a no carb, zero sugar, low-calorie alternative; perfect for beginners, advanced, ketogenic or any diet plan. GUILT FREE SNACKING: Made with wholesome ingredients, these snacks have zero carbohydrates, 10g of protein and 14g of fat to support macronutrient intake for low carb, high fat diets. HIGH PROTEIN AND NO CARB: Naturally an excellent source of calcium, our cheese crunches are great on the go, paired with your favorite meal, or topping soups or salads for the extra tasty crunch! Shelf stable, and weight loss friendly, this snack not only tastes good but also fuels the body! SAVORY & SATISFYING: Say goodbye to carb cravings with these crisps. Perfect for dipping, and munching on, these snacks are high in calcium and essential for any dieter as a no carb option! If you don't love them as much as we do, get your money back with our 100% customer satisfaction guarantee!